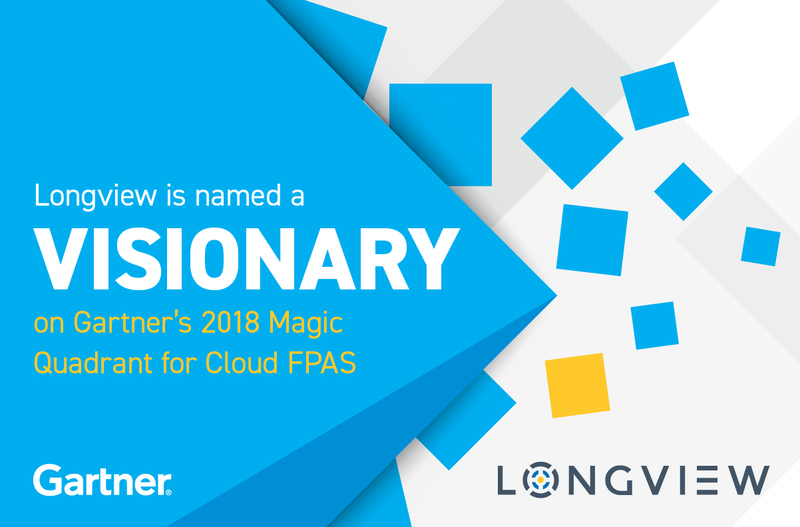 TORONTO, August 14, 2018	(Newswire.com) - Longview, a leading provider of performance management, tax reporting and analytics software, today announced that it has been recognized by Gartner in the Visionaries quadrant of the 2018 Magic Quadrant for Cloud Financial Planning and Analysis Solutions¹. With 16 software vendors included in the report, Gartner analysts placed Longview in the Visionaries quadrant, based upon the company’s ability to execute and on its completeness of vision. Longview’s success is based upon Longview Plan Powered by Tidemark, an Office of the CFO cloud solution for planning, forecasting, financial reporting and analytics. Tidemark has proven itself as an enterprise-scale solution with its born-in-the-cloud architecture, taking advantage of flexibility and scalability not possible with other legacy cube products. Tidemark customers model extremely complex business processes and tackle use cases not normally associated with performance management solutions. To read a complimentary copy of the full Gartner 2018 Magic Quadrant for Cloud Financial Planning and Analysis Solutions¹ click here. To learn more about Longview go to www.longview.com. ¹Gartner, Magic Quadrant for Cloud Financial Planning and Analysis Solutions by Christopher Iervolino, John E. Van Decker. July 24, 2018. Longview creates enterprise software that connects Finance and drives competitive advantages for organizations. Hundreds of thousands of business leaders from Global 2000 companies, operating in more than 150 countries, leverage Longview daily to make strategic and immediate business decisions with confidence. Longview elevates planning, consolidation, tax reporting, and analytics from data collection and validation to strategic business processes. Longview’s 25+ years of domain knowledge and experience, combined with our state of the art cloud-based and on-premise platforms, deliver the most robust and innovative performance management solution in the marketplace. Longview is a global company headquartered in Toronto, Canada with offices around the world. Sarah Bergseth, Vice President of Global Marketing, SBergseth@longview.com.